These Ball Lock Corny Kegs are a sturdy, reliable keg with the MoreBeer! seal of approval. These corny kegs are cleaned, de-labeled, sanitized, pressure tested and guaranteed to hold pressure upon delivery. Every Ball Lock Cornelius Keg has a 5 gallon capacity and a rubber top and bottom. While these are used kegs with slight cosmetic damages, these light dings and scratches have no effect the keg’s performance. 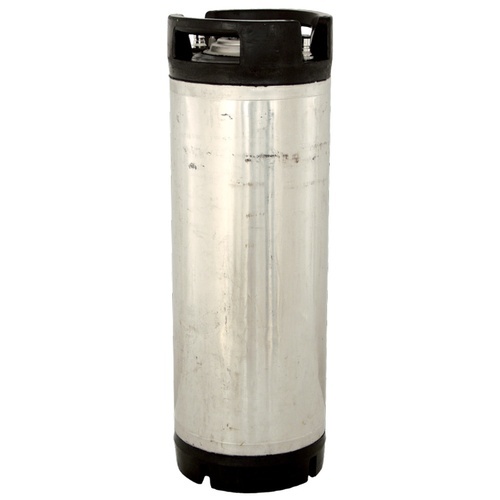 The relief valves, poppets and gaskets on these used kegs are not replaced before shipping, but we sell all of these items separately if you’d like to replace them yourself at home (part numbers KEG540, KEG450 & KEG500). If you’re looking for a truly economical way to serve your beer at home, this Ball Lock Cornelius Keg is a great option. Deep Socket for Body Connects - 11/16 in. I need a Keg fast and dont have time to troubleshoot. Wanted to start brewing cold brew into kegs and keep costs minimal. I've ordered these twice from MoreBeer and have been more than happy with the kegs. Are these kegs shipped sanitized and ready to fill? BEST ANSWER: Hi Kyle - We recommend to always clean and sanitize any keg before filling it. I haven't used this keg yet but it looks in very good shape for being used and it came pressurized. Plan on racking an Irish Red Ale next week. The first keg I received would seal, liquid would pour out whenever I shook it. I contacted customer service and no questions asked, it was replaced. I had another keg within a matter of days. And this one is just what I was looking for. Good customer service is worth a lot! Thank you. Arrived all clean in good shape. Finally, got around to filling it with some gas and it leaks from both ports. Even after soap watery testing it with pressure. Don’t buy used! One side of the bottom is bent in, but otherwise the keg is in good shape. I would buy one again. The keg was clean and works fine. I wasn't sure how it would be shipped or what the actual condition would be - it came in a cardboard box and was pressurized when I received it so I knew immediately that it was good to go. It has a few scratches but it's at least as good as any used keg I've bought from other places. I'm happy with the purchase and I wouldn't be too worried about purchasing another. Works as expected. Little clean out and new gaskets- this was as good as new. Wouldn’t shop anywhere else! I was happy. The keg was clean inside and was shipped to me under pressure so I knew the seals were good. I'll be ordering another at some point. hole on top bent up ... not holding pressure. used keg looks o.k. but look twice... the top is bent up so really hard to get it to seal right even with the new gaskets. not holding pressure like my other corny s.
The keg was definitely used. It held pressure, but was in desperate need of all the gaskets being replaced as advertised. The handle was bent. On the plus side it was a good price and with minimal work it holds my beer very well. I will buy another one at the sale price. I recently received one of these and it arrived in surprisingly poor condition. The pressure relief valve had been damaged and the metal key-ring replaced with bare metal wire, twisted in a loop. The gas-in and beverage-out posts were stuck so badly that I had to go to Auto zone and buy a huge crescent wrench and hit that with a hammer just to loosen it. Both ball-lock posts had dried pepsi sludge inside which was making them stick. This keg also had a small hole in it at one point that had been sloppily repaired with what looks like silver solder or brazing of some kind. Morebeer says that what I received is typical for the quality of these kegs, so buyer beware. For a little more money (almost the same when you consider all the replacement parts) you should probably get a new keg. The keg only had minor cosmetic damage. When I first received the keg it would leak from the poppet valves. After cleaning the keg and adding lube the poppet valves were able to seal properly. In time I will have to replace the poppet. I bought this keg in conjunction with the parts recommended by morebeer.com. Everything was exactly as expected. Good price, good product, and the information to get exactly what I needed the first time. I'm very happy with this purchase. I was very pleasantly surprised to receive a beautiful keg with hardly a scuff to be seen. I've paid the same price for kegs in much worse condition (but still functional). The keg shipped within two days and was on my doorstep two days after that. With free shipping, you really can't ask for more. I will definitely be buying more kegs from MoreBeer. Holds pressure, works as advertised.